Marketplace JC is having their Opening Day at Magnolia Landing next Saturday beginning at 12pm. They will have live music, lots of local vendors, and pop-up food stands including Eemas, Moffle Bar, Taste of Poland, PJ Ryan's, and more. Graze and Braise has come out with a new spring menu featuring several vegan options and all gluten-free. Join Barcade this Wednesday for Bock Beer Night which will help raise funds for the "Bring Back the Kids" 2018 project which benefits Harsimus Cemetery and helps bring goats to the cemetery to help with eco-friendly week eradication. 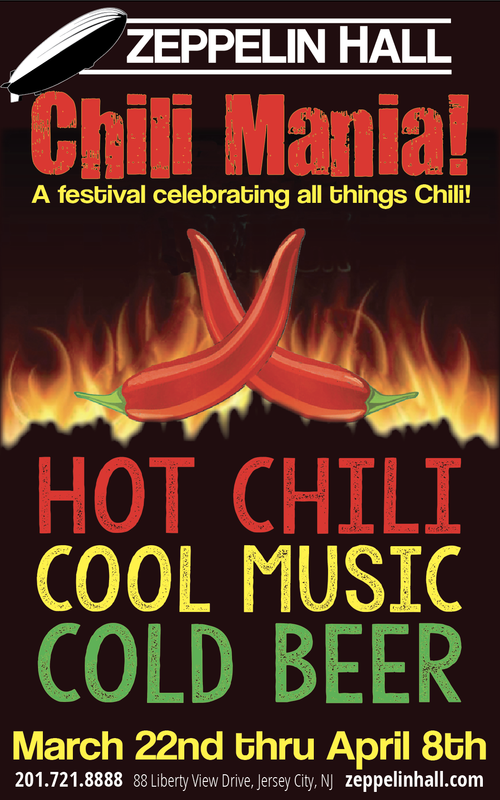 This is the last week for Zeppelin Hall's Chili-Mania. It runs through this Sunday, 4/8. The owners of popular local barbecue chain Red White and Que Smokehouse are selling all but the original location of their restaurants to their business partners. Their first location in Kearny will remain as Red White and Que while all the others will be renamed.